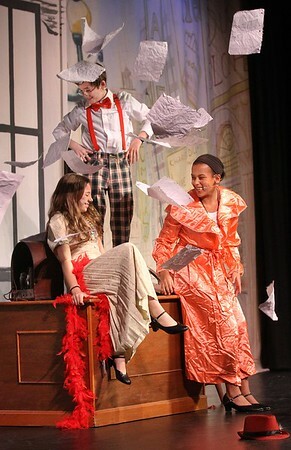 Seventh-graders, from left, Ava MacDowell plays Lily, Colin Kelley plays Rooster and Jada Exama plays Miss Hannigan during a rehearsal Tuesday for "Annie Jr." at Rockport Middle School. The musical is scheduled to be performed for the public this Thursday, Friday and Saturday at 7 p.m. and Sunday at 2 p.m. in the school auditorium. Admission is $10 for adults, $8 for students and seniors.